Trust me, I know my Hitchhiker's Guide to the Galaxy. I own 2 copies of that Trilogy in Five Parts, plus the movie. I would love to find the old radio shows, too. I've also got the original radio series on open reel tapes and can quote from them by rote. By the way - you can find all of the radio shows on Youtube [ ] -- including the newer radio series for the other books of the trilogy. They're not hard to find. And I've watched the videos, but I would love to actually own a copy. I can't always get online to watch them. Admittedly, I have not played the computer game, though. Anyway, OT: For some absurd reason, I decided I would start collecting the Party Room afros... Now my bank is full... and I had to spend a few hours using/selling/dropping/destroying a bunch of stuff to get it down to full. I admit, it wasn't my most thought-out plan. Not much but I'm only keeping ones I get as drops. Hopefully will grow soon. A lot of my collection got banned unfortunately. But keys are near impossible to get now adays (I might as well classify them as discontinued now) so I dont bother. No you can still withdraw, I dont know if any methods of transfer still exist. 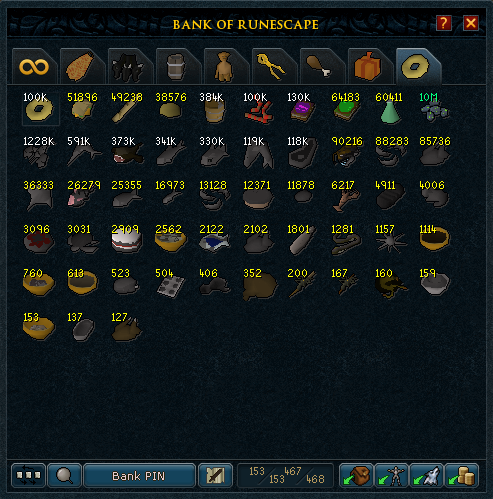 Also there is no easy way to bank them for now. don't play any more but what I still have. 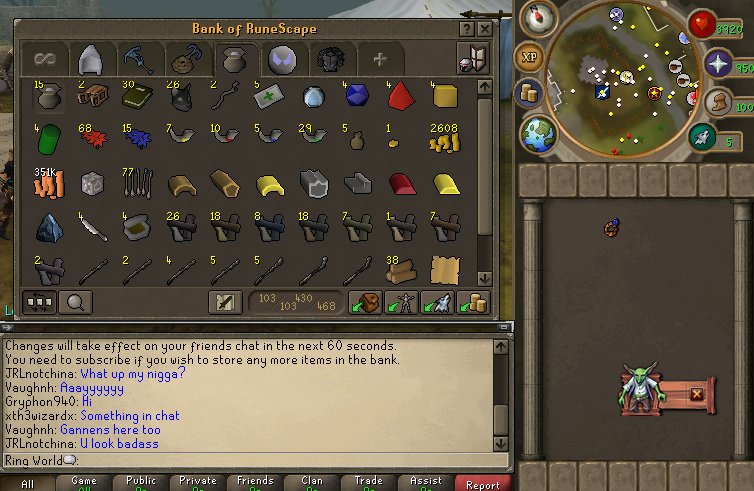 Those are chargebows (used to be slings) guam seeds and goblin mail. When I had nearing like 100b at one point bought loads of crap, I was close to 100 disks of returnings as well but lost them. The chargebows look pretty damn sweet. 300k of them is a lot considering they're 10/4h limit. Starting to see a trend of people buying chargebows but no one has anywhere near your stash though. Very nice collections nonetheless! the brass necklaces where pretty hard to get as well, 100 per 4 hour buy limit but be lucky to get anywhere near that. Only source is from noobs killing goblins. 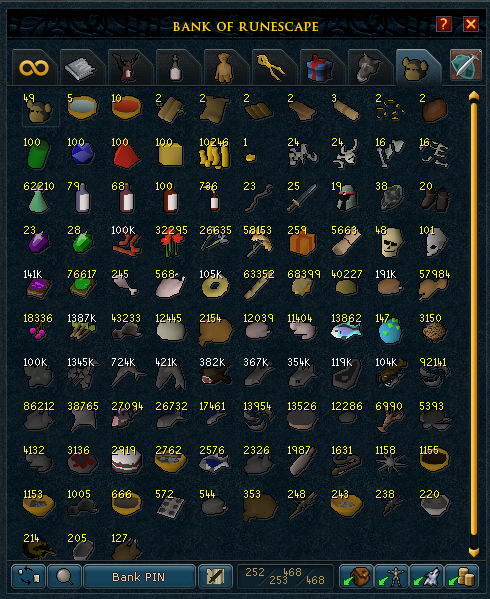 My various collections, the rune drops I have gotten from wild and slayer tasks, every glory I have made, my rare collection, my gold from 99 smithing, my potatos, and my big sharks from fishin. Updated the OP with more recent (couple days ago) collections since majority of the old screenshots had collections I no longer have. Not all of my collections are on there but those are my more favoured ones. Not much has changed in the 4 months of my last post, but decided to consolidate most my collections into one big tab!